Teesdale & Weardale Search & Mountain Rescue Team member Paul Renwick has just become a qualified Search & Rescue dog handler with his dog Skye in double quick time. Paul from Consett, Co Durham, began training Skye his four year old border collie only 14 months ago. 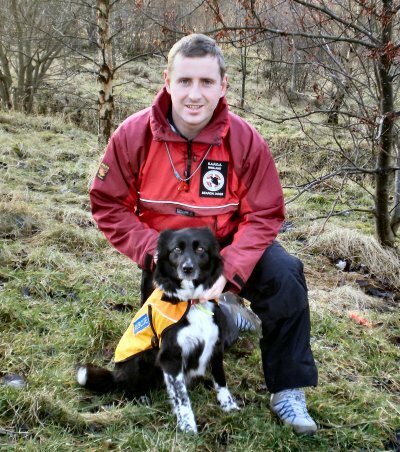 It normally takes at least 2 years to train a dog up to the high standard expected of mountain rescue search dogs. The process consists of a number of assessments culminating in a final assessment over 3 days in the Lake District. Paul said "Skye did extremely well, we were assessed in 6 areas of the Lakes over the 3 days. The aim was for us to find a hidden casualty in each of the areas within 2 hours. Each area had varying terrain ranging from fell side covered in bracken up to steep ground and crags with numerous places an unconscious casualty could be concealed. She did very well finding the casualty in all six areas". In order to train a search dog the handlers, who are all Teesdale & Weardale Team members, and the dogs join SARDA (Search and Rescue Dog Association). This is a national body which sets very high standards for its dogs and handlers to reach before they are allowed to search alongside mountain rescue teams. Skye will now join 3 other qualified search dogs in the Teesdale & Weardale Team. She will also become one of only seven dogs and handlers available throughout the North East. Team Leader Dave Bartles-Smith said "This is a great achievement for Paul and Skye. They have both worked very hard often putting in more than 10 hours a week of training. It was especially difficult for Pauls family as his wife Paula was expecting their second child through most of the training period". Paul and Skye will now work alongside our other search dogs not only in County Durham but across the whole of the North East of England. A PHOTOGRAPH OF PAUL AND SKYE IS AVAILABLE HERE.